The first great thing about the Subdomains report is that it helps you analyze your competitors’ domains performance within particular niches and locations. 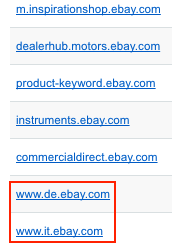 And as you know, many companies place services on their sites’ subdomains. The new feature allows users to get a list of Subdomains for a given domain (root domain) as well as a list of keywords for the exact subdomain. You can find the new report in our left menu. After opening the report, you will get a list of subdomains for a given domain. It is sorted by Traffic (by default), but you can sort it by any column. In addition, the Subdomains feature allows you to analyze language subdomains of your competitors’ sites. 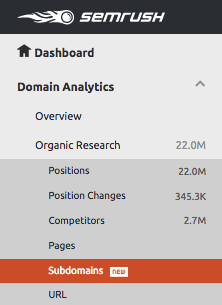 By clicking on any subdomain in this table, you will be taken to the ‘Organic Search Positions’ table, which is similar to what you can see in the ‘Organic Positions’ report, but only for selected subdomains. The Subdomains report is now available for all databases. Enjoy!